"Does a Local Business REALLY Need a Website?" 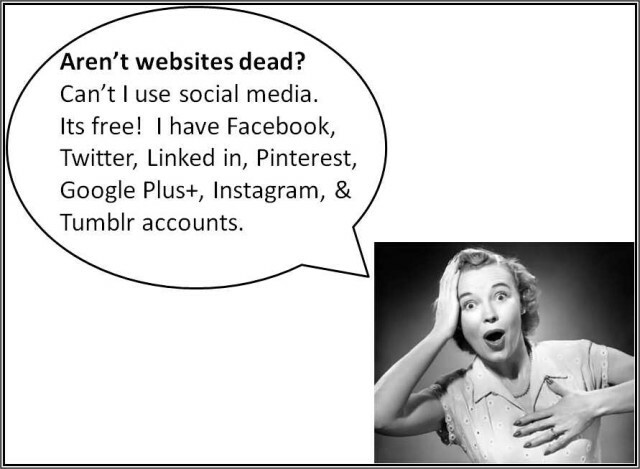 The short answers are yes, you do need a website and no, websites are not dead! I know, you’re thinking that with the influx of social media pages, why should you waste your money on creating a standalone website for your company? Having a website made for you seems like an unnecessary expense. I find especially troubling because entrepreneurs and small business owners who are just starting out need the visibility. And nothing build your reputation online faster than a lead generation website. And for those business who are practically starting over and struggling to recover from the past few years, an or authority website helps cement your business into the minds of your customer base. But despite the fact that I feel every small business should have a website to use as their primary marketing hub, there are several issues with relying on social media to promote yourself. First, the problem with “free” social media sites is that any potential customers you drive there have to be registered thru that site’s membership in order to interact with you. This registration makes those customers actually Facebook’s or LinkedIn’s subscribers, not yours. And if you track your Friends or followers carefully, you might be surprised to learn that less than 2% actually convert into paying customers. Just 2%. That conversion rate is only a little better than traditional direct (junk) mail. So while you might be pushing out your marketing messages on the hottest social media sites, nobody is really taking the time away from checking out all those cool pictures or reading that new recipe to buy anything from you! On the other hand, by using your own website as a marketing tool, you will have an opportunity to get those fly-by visitors to register with you. By offering an incentive to get potential customers to join your email list, you will have a chance to connect with them and turn them into paying customers. You might have noticed lately that almost all the social media sites are stating to charge for either premium accounts add on some type of monetization system. This is because despite how much we might love the them, these sites are at the end of day, are in the business of making money. They might take their own sweet time to find a business model that suits them but they will eventually have to find a way to pay back all their investors and venture capitalists. So while it might be “free” for you to piggyback your marketing off a social media site, someday in the future they might come knocking on the door of your “business” account asking for their share of the money. This is why if you invest in your own website, the cost is prorated over time and is always cheaper in the long run than marketing through any third party site. When I say it takes up time, I mean that if you use social media marketing to it’s maximum advantage, you will be spending a good deal of your work day, posting, tweeting, following, re-tweeting, and messaging several times a day to people, who probably will not buy from you. Unlike sales, you can’t get recover lost time. If you spend hours out of your day working on your Facebook, Twitter, Linked in, Pinterest, Google Plus+, Instagram, & Tumblr accounts, when will you have time to actually run your business? One of the greatest benefits of using a business website for your web marketing is that it creates a central location for your customers to find you online. If they don’t have to register with Instagram just to see your boutique’s fashion photos or keep their Twitter account active at work, just to get news about a weekend sale. By using your website as a local marketing “hub” – you automatically focus your energy and promotional efforts. A Kelsey Group study shows that roughly 85% – 97% of all consumers use the Internet to research local products or services before they buy from vendors in their area. And 1 in 5 of these local website visitors made a purchase within 1 to 2 days of their visit. In other words, many your customers will research you online first then visit you to buy what you offer. This just highlights the importance building better local visibility by creating a great customer-focused website that you both own and can control… something you can’t say about any of the social media site. If you are interested in learning how an affordable website could benefit your business, then I invite you check my website services here. Why is a Website Important for a Small Business?